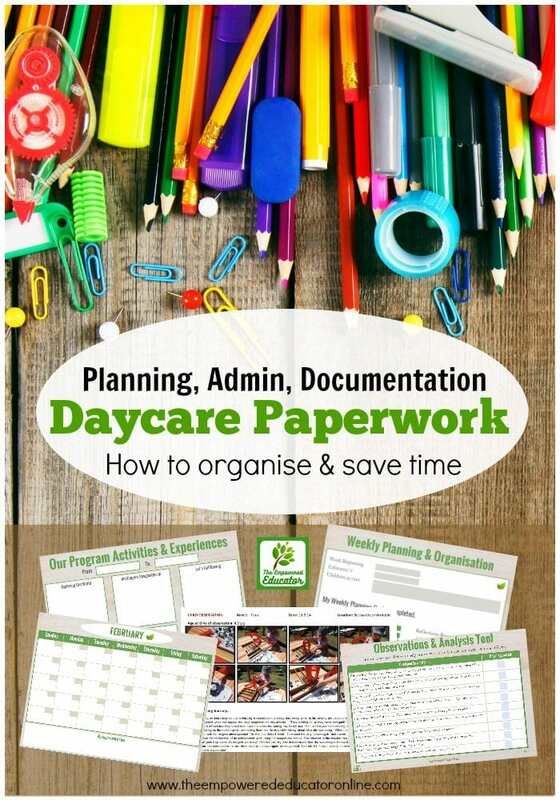 10 Ways to organise and manage daycare paperwork! I’m pretty sure most early years educators would agree with me if I said the administration, planning and documentation requirements of an early childhood educator can seem overwhelming at times and organising daycare paperwork takes a lot of effort! However, I often see educators doubling up on paperwork and documentation because they don’t know exactly what they are meant to be recording or why and this leads to extra work as they try to cover all bases and tick off all the boxes to display that magical ‘evidence’ that they are meeting outcomes and adhering to best practice expectations. If you are one of those educators approaching burnout and feeling like you want to give up because of your growing pile of paperwork and overall feeling of always being behind, go grab a cuppa, take a moment for yourself and read through some of my tips for getting back your work mojo and gaining some precious time when it comes to admin. You can even download my free guide with all the important strategies from this post! Click image below to have one sent out to you. As we approach the 2nd half of the year it is a perfect time to challenge yourself to assess where you are currently at, what’s working and what isn’t and then make a few changes. You need to develop a system that supports your individual early childhood role, skills and environment. 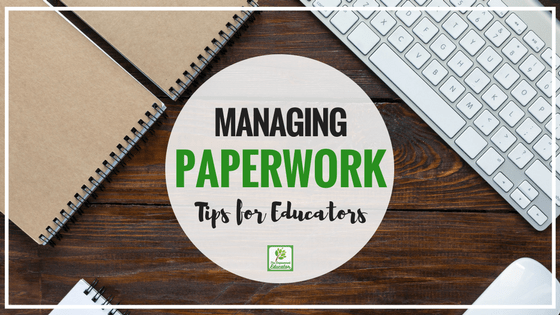 What works for one educator does not always work for everyone but there are a few simple action steps you can take right now that will help you get organised and ready to face the rest of the year in control of your paperwork…no matter your role! Ready to take the challenge, make some changes and get organised before the end of the year is here? Let’s do it! Through knowledge comes the empowerment to seek change and question expectations. Take a look at the planning cycle below, get out a blank piece of paper and write down what forms or sources of paperwork you currently use to document and meet each step. Is there a step you find confusing or you don’t fully understand why you have been asked to complete a certain template for this step? ASK for clarification or further training and professional development resources. Talk to your educational leader, director, CDO, Coordinator, Mentor for guidance. 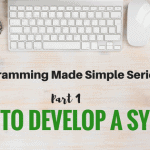 Read through the programming articles on this blog for simple guides and explanations. If you don’t know why you have to write something find out! I cannot stress this enough as a timesaver because when you better understand the steps you are taking and why, everything begins to fall in place and you begin to feel more confident that you are covering what you need to without overcompensating and writing more and more. Breaking down your huge ‘To Do’ list into smaller more manageable tasks can help you to feel organised and complete necessary paperwork more efficiently. By forming a system that you work to in a regular timeframe you begin to know exactly what has been done and what is yet to do. No guessing and therefore less chance of overwhelm, confusion and doubling up on admin you have already done. Think about the actions you could add to a piece of paper split into the three categories. What do you need to get done everyday? Every week? 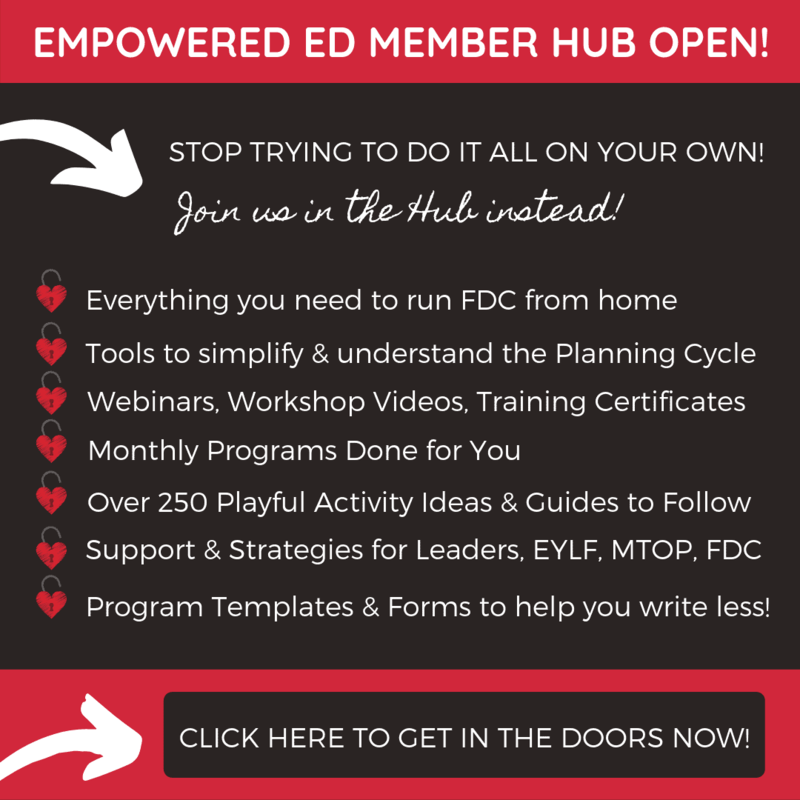 Every month to feel in control of your planning and programming? A few tasks to check off and take action on at regular intervals seems a whole lot more achievable than that huge list of jobs I know you have hiding in the back of your diary or folder right now! For a daily organisation guide think about the following questions to help you get started creating your own checklist of tasks or reminders. You just want to create something that helps you feel organised each day, a tool like this also helps you to recognise and document the actions you have taken. Have you completed any observations via jottings, notes, audio, video or photos taken briefly for a child and/or group today? Who? What do you need for today’s indoor environment, activities & materials setup? Is environment ready, safety check done? What do you need for today’s outdoor environment, activities & materials setup? Is environment ready, safety check done? What creative and craft materials still need to be prepped or made ready for use? What will be used tomorrow? Have you recorded spontaneous and significant open ended play on a current program plan or diary at end of the day? Did you note any family and/or staff feedback in diary or on plan? Have parent and carer daily communication tools/methods been completed and emailed or printed? 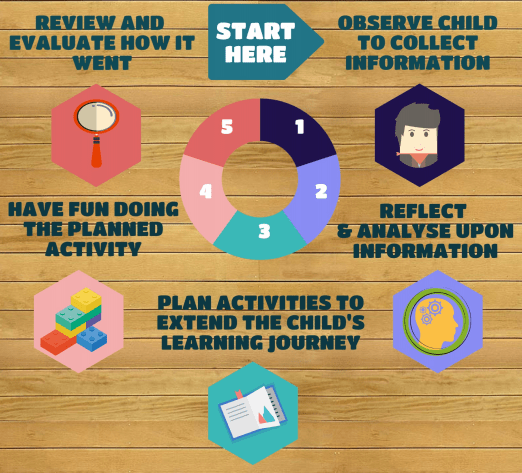 Have the planned activities with a daily focus child/children been completed? Obviously every educator will have slightly different tasks to list but when it comes to documentation finding a way to check off some of the basics each day allows you to set aside time for more in depth tasks for the end of a week or month. The questions above should help to get you started. Then you can begin to also identify tasks for weekly and monthly guides. 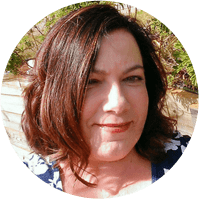 If you think that sounds a little like to much hard work and would prefer to just get started right away on being organised (And why wouldn’t you? Nothing wrong with seeking some extra support!) 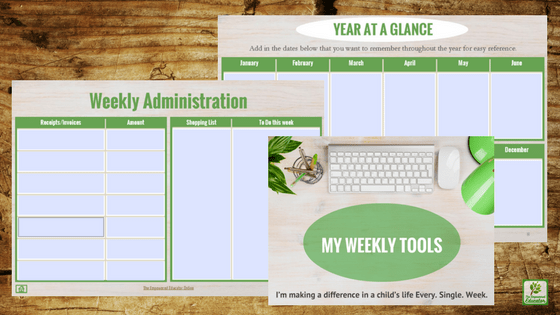 you can use my Educator Organiser and Planner as I have already done all the hard work for you. 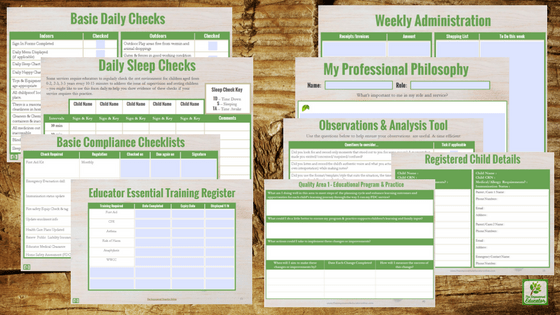 I developed it as an easy to use tool to help educators manage their time more effectively and finally feel confident with daily, weekly and monthly planning expectations. It’s packed with calendars, checklists, guides, templates and more – you just download and start using straight away – either print and write or type and save. How Can the Organiser help me with daycare paperwork right now? Below is just some of what is included and there is a version for centre based educators as well as home daycare based educators as each has different admin and organisation needs. Doesn’t matter what time of the year you buy it as there are perpetual calendars so you can start anytime and use the same organiser year after year! Get on top of that paperwork and planning with…. A step by step video tutorial walking you through how to get the most out of your organiser tools and program efficiently and effectively. 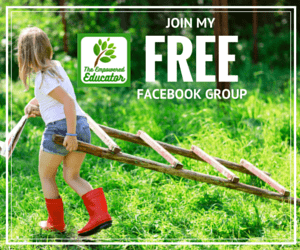 An easy yet comprehensive guide to help you understand the basics of the EYLF and plan activities and environment changes for each of the outcomes & general learning areas (without needing to use confusing numbers and codes!). Planning, Communication and Organisational tools and pages to use daily, weekly, monthly and annually. A Quality Improvement Plan (QIP) support tool. 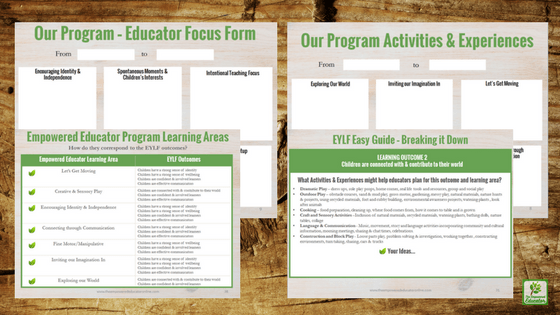 Weekly Program, Forward Planning and Educator Focus Templates ready to type into -or print out and write. 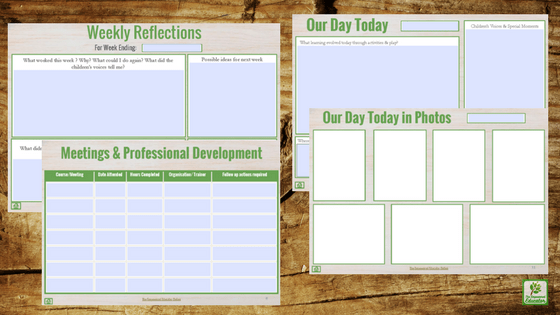 Our Day Today and Our Day in Photos templates to display or print for families. A professional tool that looks good, is easy to navigate and enter information into quickly and keeps all the essentials in one place. Perpetual calendars and special events pages that can be personalised and used year after year saving you time and money every single year! 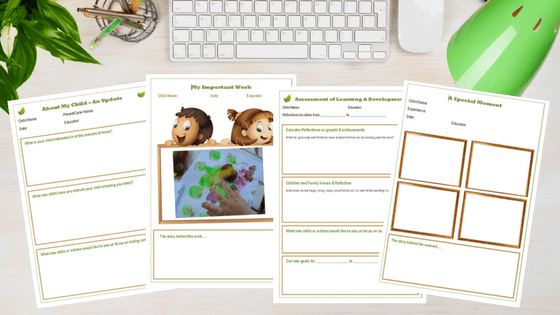 A dedicated page to help you complete weekly reflections that only take minutes but will be helpful (and save time! )with your forward planning. Pages to help you look up children’s medical details, Birthdays and contact and emergency specifics all with one click – no searching through files! Links to play recipes to make your own resources and save money. Easy to use pages to keep you organised and ready for every week with to do lists, shopping lists, resource lists and places to record invoices and receipts. Nearly 200 pages of checklists, calendars, charts and templates to help get you organised and on top of your role. Print friendly black and white version for those who want to save ink but still print out a hard copy to place in a folder. Want to put together your own system instead? Keep reading for more paperwork organisation tips to get you started! 3. Collate and store documentation sources systematically. Before doing anything else, stop and ask yourself if right this minute you had to show evidence of a child’s individual learning journey while in your care – would you know where to find all the pieces of the paperwork puzzle? 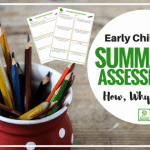 Finding bits and pieces of paper to inform your forward planning each week and summative assessments (assessments of learning) throughout the year can take up a lot of precious time. Decide how you are going to store all documentation sources for individual children and stick with a system you know. Is it in a separate folder for each in a filing cabinet? Is it all on the computer? Is it in drawers or a cabinet? Observations, the analysis of learning from the observation, the subsequent forward planning including possible extensions and the program all need to tie together and show a story of the journey or distance travelled so far by a child and how you have supported and guided this journey through your work. So it makes sense to keep everything together doesn’t it? I like to use an organisational tool that lists all of my documentation sources and where I can find them at any time. It tells me when that source was last updated or perhaps that I am behind in some areas. 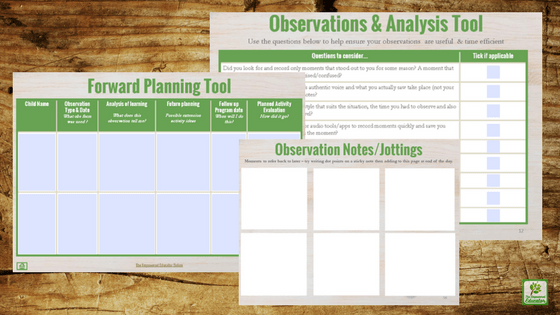 I have included a printable of this tool in my Summative Asessments Toolkit that you might find a useful resource. Whatever system you use whether filing cabinet or computer or a box on a shelf….make sure to clearly label and update often so you know exactly where to find something when you need it. It only takes a few minutes to write or type out a few labels but it saves so much time in the long run! 4. Rethink and Save Time with Child Observations. Not all observations need to be written out. Consider using tools such as audio, video, images, digital apps, tablets and others. Decide on the form, tool or template you want to use and then modify as you need to. You don’t have to stick to the one style – use what works best for you, there is no ‘rule’ about what method you need to use to observe. Again, if you don’t understand the form or system you have been asked to use, seek clarification and support because when you are confused and unsure this quickly leads to resentment and overwhelm. Try using sticky notes or a tablet notepad to jot a few points or conversations down then come back to write up at a later time. You can also use photos and video in this way – they will record the story for you to come back and document formally when you have planning time or the children have rest time. If you work in a daycare centre with a number of educators in the same room keep it simple by hanging a clipboard with paper or an exercise book for educators to add observation jottings or moments of significance. The idea is not to waste a whole lot of time writing out a rough observation outline then having to come back later and waste time rewriting everything again! Just stick to notes or photos to jog your memory. Use the language of the EYLF or the guidelines for your region to explain the story and learning and do away with the need to look up and link to outcome numbers or use complicated colour codes all the time. This also helps you gain a better understanding of the outcomes and what you are aiming for overall. Keep them short, keep them meaningful because this saves you time when you have to analyse the learning and forward plan in the next steps. Don’t fall into the trap of documenting everything or writing an observation because you ‘have to get one for this child before end of the week’. Not a good use of your time and not helpful for the child either. You might use a portfolio but remember that portfolios compiled with the intention to reflect a child’s learning journey (and meet documentation requirements) are not just a collection of artwork and stories. Consider how you will use your portfolios or learning journals to document the whole child, their voice and the progress made on their journey so far. 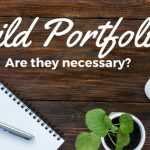 Read through this post on portfolios to ensure you aren’t doubling up on paperwork (or missing something vital you thought you had covered) if you do use portfolios. Consider using your computer and a few simple folders to create your own digital or paperless portfolio – no apps or complicated online systems to master and you can set it up the way that works for you and therefore ultimately saves you time. You can view a video with my tips for setting up a digital portfolio on your computer here. This step in your daycare paperwork cycle shouldn’t be complicated or time consuming. 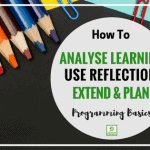 Choose whether you want to do daily or weekly and then stick with it so you know you can show evidence of regular reflection and that you have used it to guide your programming and work practice. Use sticky notes to add dot points about what worked, what didn’t, something you want to remember for future planning, why you would or wouldn’t do a certain activity again, possible changes needed to the environment, interests or spontaneous play that evolves. Stick them into a exercise book or folder at the end of each day and by the end of the week you have notes to guide your plan for the following week or month. Jot notes directly onto a space on your displayed program or turn over and write on the back at the end of the week. Perhaps use a diary but keep your reflections short and to the point, they are meant to be useful! Keep in mind that as educators we reflect on our own everyday practice and program but we also analyse and reflect upon the children’s learning and development. Decide on a system for each method. Use the style, template, system or form that suits you best – that you understand and know you can work with and complete easily. 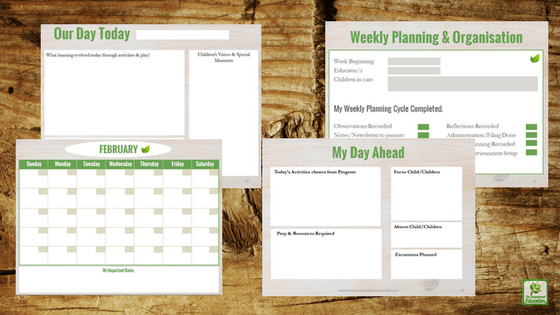 Include spaces for parent/family input, spontaneous experiences, reflections and individual focus child activities on your program and simply add information throughout the week. Ensure whatever system you use encompasses all areas of the framework or outcomes you are working to. I like to include interest area headings in each of my program template boxes that I know reflect a broad range of activities and experiences that lead to the learning outcomes. If I plan at least something for each of those areas and write it in I know without a doubt I am providing a well rounded program that works toward meeting a range of outcomes for the group each week. I can add more as I go or reflect on why I chose not to go ahead with a planned activity. Don’t try and plan for everything all of the time. Some weeks the focus might be stronger on some outcomes than others but this allows you to really explore and extend upon this area of learning rather than becoming overwhelmed trying to tick everything off before the end of the week. Often the children will lead you in a different direction as they manage and direct their own play. Just add a few quick notes to your program or diary to record this, no need to totally rewrite your original program! If you have difficulty thinking of activities each week and feel frustrated trying to fill in a program then just add a few activities to start with then as the week progresses add in spontaneous activities and child led experiences to your plan each day. This still shows a record of ongoing learning and planning. If you work with other educators in a room it also offers an opportunity for them to take part in the planning and add to it as the week progresses. I like to keep a folder with blank program templates in it on my sign in desk and if I think of activities or extension opportunities I want to include next week I just write them straight onto the blank plan and sometimes my program for the following week is already half completed before I sit down to write it out. Educators tend to spend a lot of money on resources and toys for the children in their care – especially family daycare educators! Before a new financial year begins think about putting a method in place that will save you precious time and money when it comes to preparing a tax return. I must admit to being terrible at this step and every year it causes me a lot of stress because I have to waste a week trying to find receipts, put them in order and enter them into my files or computer accounting system. Every year I swear I will either spend less money (and therefore have less receipts at end of the year…genius right?) or put a system in place of entering the information regularly so its there ready at tax time. The not spending as much thing didn’t really work out funnily enough so I now use the following method! I scan the receipt before filing and save in a file on my computer (one for each month)I store these files in a dropbox folder in the cloud so I know I won’t lose them but on your home computer is fine as long as you back up regularly. If I receive a receipt via email I simply save it straight to the corresponding monthly folder in dropbox – no need to waste time printing. If you want to go a further step you can then take a little time at the end of each month to add your expenses to an online accounting system like Quickbooks online or your own computer software like Harmony or an excel spreadsheet perhaps. Label folders in the filing cabinet so you know where to find the forms when you need them. Keep separate to the children’s documentation paperwork so there is no confusion. Keep copies of all forms used regularly in a ‘master’s file on the computer ready to print out or already printed in a folder divided up into relevant sections. So when you need that excursion, risk assessment, accident etc foirm you can get your hands on one immediately. When working on your own there often isn’t the time to leave children to go print a copy out. Keep 2 or 3 parent handbooks, enrolment or information kits printed and compiled ready to hand out to prospective new families so they immediately see a professional and organised service and educator. I have also kept a PDF copy of the parent information pack to email to parents who request information. This saves time and printing costs as you simply attach the file to an email as needed. Keep a file stocked with advertising and promotional tools for your family day care so promotion is an ongoing strategy rather than something you only do at the end of the year when it is often to late to secure new bookings. Type and save a couple of letter templates you can easily edit when needed such as late fee reminders, fee rises, bring to care reminders, toilet training, healthy lunchboxes, healthy and sickness policy etc…those you often use. Do not allow families to get more than 2 weeks behind in their fees. Act immediately with an assertive letter, be clear about the amount owing and the next steps if they do not pay (For me this was no care available until fees paid). Tough but saves time you don’t have to waste on chasing people up! 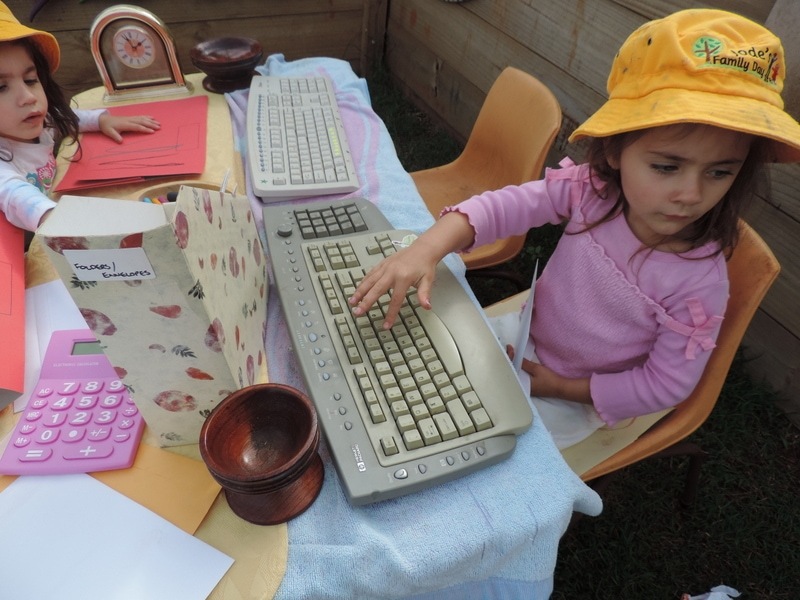 If you are someone who likes to use the computer to organise your daycare paperwork and general administration keep the following tips in mind. Label your folders in a way that makes sense to you and that you know you can find again easily. Keep a ‘master copy’ folder that contains all the important forms you need to run your service and team. Do not enter information on these forms. When working on documents and typing in information always keep originals to the master copy folder, open then ‘save as’ the form you are using. Rename to something relevant and save to a different folder. Consider naming a folder for each child in care to keep details like immunisation, contact details, communication along with folders for observations, parent communication, programs, newsletters, parent notes, professional development resources etc so you always know where to find what you need quickly. I know it seems like a lot but that’s just because I have tried to break it down into smaller steps under each area for you. This is certainly not meant to make you feel even more overwhelmed though so right now take out a piece of paper and choose 3 areas from those above that you could work on organising – forget the others for now…just take small steps and then take a few more once you have those sorted. Tap play on the video to take a look inside the Organiser…. 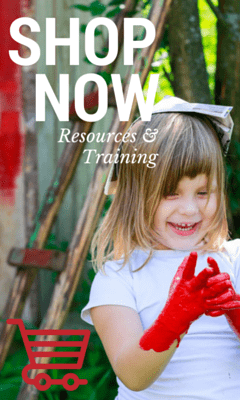 « Taking Dramatic Play Outside – Ideas to get you started!